Shops and houses belonging to members of the Ahmadiyya community in Panchagarh have been attacked by followers of several religious organisations. At least 21 people were injured during the attack at Ahmadnagar on Tuesday night after resentment grew among Sunni groups about a ‘Jalsha’ or annual convention planned by the minority Ahmadiyyas. Faced with the protests from conservative groups, the district authorities after a series of meetings had on Tuesday cancelled the three-day Jalsha that was scheduled to start in Ahmadnagar on Feb 22. But followers of groups including the Khatm-e-Nubuwwat Shongrokkhon Parishad descended on the streets of Ahmadnagar, the part of the town where members of the minority Muslim sect have their homes and businesses. Police fired teargas shells and rubber bullets to bring back order while the attackers demanded the cancellation of the Jalsha. Of those injured in the violence, one person has suffered critical injuries, said Panchagarh Central Hospital resident physician Pradip Kumar Banik. Since early February, followers of conservative groups were protesting the Jalsha under the banners of Khatm-e-Nubuwwat Shongrokkhon Parishad, Iman Akida Raksha Committee, Islami Jubo Samaj and local Towhidi Janata. Their campaign was supported by Hefazat-e Islam chief Allama Shah Ahmad Shafi. On Tuesday night, protesters began demonstrating at Chowrangi intersection, Dhaka-Panchagarh Highway and other points of the town, said Panchagarh Central Police OC Abu Akkas Ahmed. Mohammed Golam Azam, additional deputy commissioner, was announcing the decision to cancel the Jalsha from the loudspeaker of the Panchagarh Bazar Jame Mosque around 11:00pm. He urged the protesters to go home and avoid “attempts of provocation”. The traffic in those areas came to a halt from 9:00 pm to around 11:00pm. Shops and business centres were shut amid fears of violence. But despite the announcement and police efforts, a group of protesters went to Ahmadnagar and attacked the houses and the Ahmadiyya convention site, said OC Abu Akkas. “We took along Municipality Mayor Towhidul Islam and leaders of the organisations in the movement and told the protesters about the decision to cancel the convention. But they were still confused and continued to protest by putting up blockades. “Later, some of them crossed the Karotoa River and attacked the convention site in Ahmadnagar,” said Anwar Sadat Samrat, general secretary of district wing of the Awami League. At least 40 members of their group were injured in the two-hour long attack, said Taher Jugol, president of the Ahmadnagar Muslim Jamaat. The women of the community were dragged outside of their homes and physically harassed, he said. Some houses were also torched, he added. “They have tried to create unrest by staging protests even after the decision to cancel the convention. The perpetrators will be punished following investigation,” said Panchagarh Deputy Commissioner Sabina Yasmin, while visiting the injured in the hospital. The Ahmadiyya sect, a minority group in Bangladesh, has been subjected to many attacks by religious fanatics. One person was killed in a suicide bombing during a midday prayer session at an Ahmadiyya mosque in Rajshahi’s Baghmara in 2016. Hefazat-e Islam, a madrasa organisation based in Chattogram’s Hathazari, has been pressing the government to declare the Ahmadiyyas ‘non-Muslims’. Majid Ali, additional deputy inspector of police (Rangpur Range), Superintendent of Police Giasuddin Ahmad visited the scene and the injured at Panchagarh Central Hospital. Some people are worried about a message of ‘Love for All and Hatred for None’ ??? Around 50 people have been injured in co-ordinated attacks by hardline Islamist groups on minority Ahmadiyyas in Panchagarh over holding of a “jalsha”, despite the local authorities cancelling the annual convention of the minority group. The attacks took place on Tuesday night on the streets of Ahmadnagar, the part of town where members of the minority Muslim sect have their homes and businesses, confirmed Officer-in-Charge (OC) of Panchagarh police station Abu Akkas. The incident occurred between 9pm and 11pm. 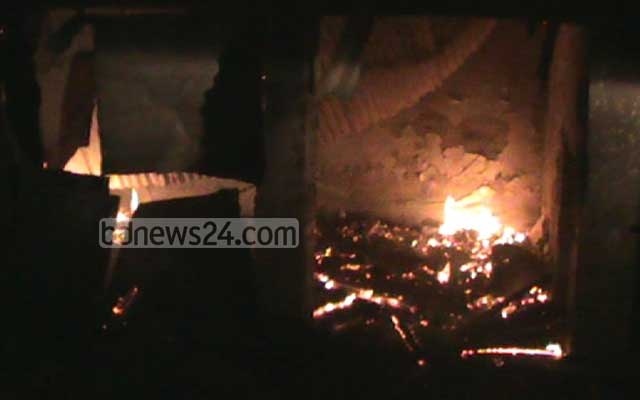 The injured have been admitted to Rangpur Medical College and Hospital. The district authorities on Tuesday cancelled the three-day “jalsha”, which was scheduled to begin on February 22, amid protests from conservative Muslim groups. A five-member probe committee has been formed to look into Tuesday’s attack. The committee constituted with additional district magistrate Ehtesham Reza as its head has been asked to submit its report within three days. Meanwhile, teams of the district administration and police administration visited the area on Wednesday and talked to the followers of the community. Besides, police and Border Guard Bangladesh members have been deployed in the area to fend off further trouble. Meanwhile, Shah Ahmed Shafi, the de facto leader of the hardline Islamists in Bangladesh and the inspirational leader of the umbrella organization Hefazat-e-Islam, has demanded the Ahmadiyya Muslim community declared as non-Muslims, immediately. He also demanded the three-day Ahmadiyya religious congregation—scheduled to begin on February 22 in Panchagarh district—be stopped. Shafi made the demand on Wednesday during a press briefing at Al-Jamiatul Ahlia Darul Ulum Moinul Islam, also known as Hathazari Madrasa, in Chittagong. While speaking at the press briefing, Shafi said that they will be compelled to undertake tougher responses, like a long march towards Panchagarh, if the congregation is not stopped. “The demand to declare the Ahmadiyyas as non-Muslims is part of protecting the fundamental principles of Islam. Muslims [will] face various problems in their social and religious life if the Ahmadiyyas are not identified and declared as non-Muslims,” said Shafi. Islamists do not consider the Ahmadiyyas- also known as Qadianis- to be Muslim and have called for them to be banned. The 1,00,000 Ahmadiyyas in Bangladesh have faced repeated attacks and are often barred from establishing mosques. The group is banned in Pakistan. Rangpur Additional Divisional Commissioner Abdullah Sajjad, Pachagarh Deputy Commissioner Sabina Yasmin, Superintendent of Police Md Ghiasuddin Ahmed, and other officials inspected the scene of the incident and visited the injured. They gave assurances of bringing to book those involved with the attacks. Police and BGB have been deployed in Ahmadnagar to keep the situation under control. Leaders of the community protest the attack on their people, their houses and businesses in Panchagarh. Nayeb-e-ameer of Ahmadiyya Muslim Jamaat Ahmed Tabshir Chowdhury, at a a press briefing in Salana Jalsha field in Ahmed Nagar in the afternoon, claimed at least seven of the Muslim minority were injured, three critically. He urged the government to take immediate action against the criminals who organized and carried out the attacks. Among others, Mawlan Abdul Awal Khan Chowdhury, in-charge of Ahmadiyya Muslim Jamaat Mollabek, Taher Jugal, president of Ahmadiyya Muslim Jamaat Panchagarh unit and Shafiqul Islam, president of Panchagarh Press club also spoke at the programme. Around 8pm on Tuesday, followers of conservative groups under the banners of Khatm-e-Nubuwwat Shongrokkhon Parishad, Iman Akida Raksha Committee, Islami Jubo Samaj and local Towhidi Janata – all protesting the celebration of the “jalsha” – started a procession. After the procession ended, the protesters blocked the Dhaka-Panchagarh highway near Sher-e-Bangla Park intersection in Panchagarh town. At that time, traffic on both sides of the highway came to a halt. When the protestors tried to march towards Ahmadnagar, police blocked their path on Korotoa Bridge. Enraged, the protestors started throwing brickbats at the police, who used rubber bullets and teargas to calm the situation. A chase and counter-chase ensued between the protestors and the law enforcers that lasted for one and a half hours, injuring people on both sides. At one point, a group of protestors broke away and advanced to Ahmadnagar, where they vandalized and set fire to several houses of the Ahmadiyyas, injuring at least 40 people of the minority group. Movement in the area was disrupted from 9pm to 11pm, while local shops remain closed fearing further violence. The last few decades have seen a number of attacks targeting Ahmadiyyas in Bangladesh. In 1999, a bomb ripped through an Ahmadiyya mosque in the southern city of Khulna, killing at least eight worshippers.